Yesterday when I stopped to fuel up my vehicle, I took a double when I saw this placed carefully on top of the pump. I glanced at the other pumps and saw no other Bibles. I picked it up, looked for “advertisement” on the plastic wrap, and found none. Seeing this Bible warmed my soul. I placed it back on the pump….with hopes that it would end up where it needed to be. Or maybe it already was? This entry was posted in books, Curiosity, Making a Statement, Oklahoma and tagged Bible Belt, I have hidden Your word in my heart, Psalms 119:11, Surprise at the gas pump, The Bible, The HOlY BIBLE, Walmart gas pump. Bookmark the permalink. 15 Responses to Bible Belt? Nobody puts their Bible in a plastic bag or was it raining in yer neck o’ the woods that day? I’m thinking it’s an outreach program. Hope it’s a readable version like NIV. One of the best things I ever did for myself was to take a 2.5 year Bible study called Amazing Collections (they have a website) where we read a book of the Bible each week. Actually READING the Bible will help build your faith more than Sunday school or church, in my humble opinion. Now we are doing two back to back studies by Angela Thomas that are also excellent. Nope….no rain. And it was NIV. Pretty cool. Sounds like terrific study! Thanks for the info! All for a reason. Praise God! Wow… a message there somewhere… awaiting the right person.?? 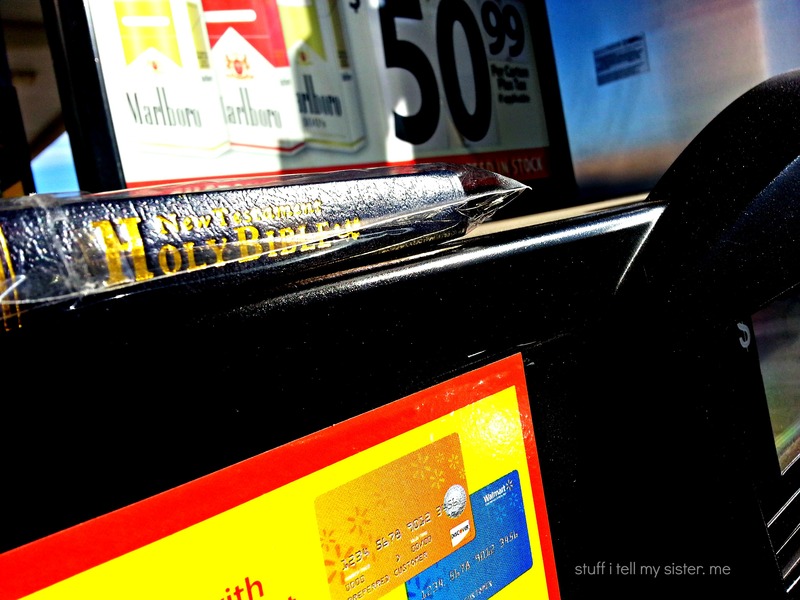 Get your gas, beer, cigs and BIBLE! Pretty cool. Awesome. Maybe we should put them all over the country. Clint showed me an extended video of the knockout game and I was appalled. These kids they were interviewing were so caviler about doing this horrible act. And the security footage of the attacks was so brutal. They need to catch these kids and throw them in prison. Not extended sentences, but real prison so they can see the consequences for their actions. I still believe the scared straight program should be required in Jr. High. A prison visit for kids so they can see where they don’t want to spend “time”. They usually wait to do this til their already in trouble…. Finding the Bible might have been someone playing it forward. They took a chance that the Bible would not be destroyed and find a person in need and the words within would connect and lead them in the write direction to soothe their weary soul. This is indeed a beautiful story and gives hope to a weary soul. Thanks for sharing.